Travel Costs > How Much Does a Hot Air Balloon Ride Cost? A hot air balloon ride can be an exhilarating experience for anyone who gets the opportunity. Hot air balloons are among the oldest flying vehicles and are operated on the principle that warm air rises in cooler air. The air inside the balloon is heated by a large propane flame, which is what allows the balloon to rise into the sky. Suspended below this balloon is a basket, usually made out of wicker, that can hold passengers during flight. Because they are not able to be steered, a hot air balloon can only travel as fast as the wind blows. On average, a hot air balloon ride is going to cost anywhere from $75 to as much as $275 per person. Most rides in this price range will last about an hour, and the price will depend on your geographical location, the time of year, when you want to fly and the company you choose. Aerogelic Ballooning, a hot air balloon company located in Arizona, charges anywhere from $159 to $599 per person, according to the official website. Rainbow Ryders, another hot air balloon company, stated on its website that they charge $150 to $200, and the prices will depend on the season. Refer to our table below to see what companies across the United States are charging. Before riding, you will be briefed before riding so that you know what to expect. A reputable company should offer a short orientation for their passengers, and this will include instructions on what to do during take off and landing and offer a few rules that need to be followed while in the air. Typical rides are going to last about an hour, and the average balloon can accommodate up to four people. When you factor in the pre-flight preparation, flight and the post-flight activities, the time can total close to three hours. This can greatly depend upon the weather, especially the wind. Most of the popular packages available will include a sunrise, sunset or moon viewing. Some companies can pick you up at a designated location ahead of time, but most will prefer you to meet at a certain location where the balloon will be set up. Depending on the distance, this can cost an additional $15 to $40 or about $1 per mile. Be aware of sales tax and additional fees. Some companies are not upfront about this. Many companies may include additional add-ons that include lunch, champagne or pictures, for example, for an additional fee. A tip, while not necessary, is often considered, especially if the trip went well. Many companies require you contact them at least 72 hours in advance if you want to cancel. Failing to do so can incur a rescheduling fee. Always think about your safety. Check and be aware whether the balloon rides you were riding have an FAA-licensed pilot that really knows how to fly the balloon and have insurance to operate. Check online reviews, the BBB, the local Federal Aviation Administration office and Google to check out the company’s reputation. Pay attention when the passenger orientation is discussed, so that if you will face some troubles, you know what to do and will be prepared. While younger children can fly, it is recommended that children under the age of five stay home. Some have strict rules where children under a certain age cannot fly at all. Get the exact quote in writing before you fly. As mentioned in the extra costs, some companies may charge unnecessary fees. 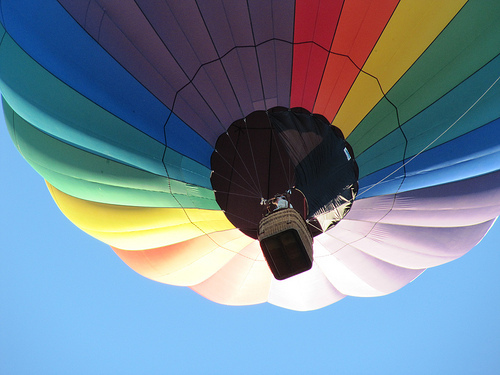 Hot air balloon rides can only occur during certain weather patterns. If there is no wind or the wind is too strong, your hot air balloon ride may have to be rescheduled. Any kind of rain or storm can also pose a problem, as can fog. Some hot air balloon companies may offer coupons or discounts online. Check out Groupon or official websites to see if you can take advantage of any deals. Discounts may be available if you purchase a ride for more than six people.